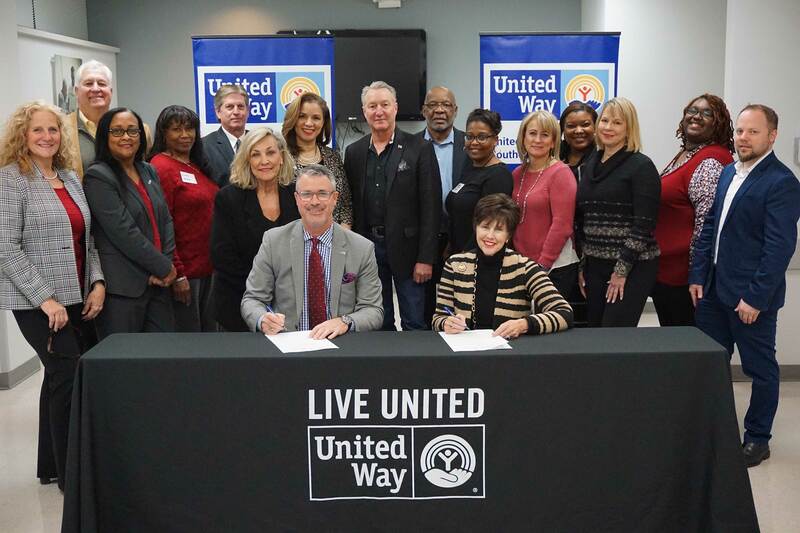 DCFS Secretary Marketa Garner Walters and UWSELA President and CEO Michael Williamson sign a partnership agreement to help expand workforce training opportunities for SNAP recipients in seven parishes in Southeast Louisiana. NEW ORLEANS, LA — The Louisiana Department of Children and Family Services (DCFS) and United Way of Southeast Louisiana (UWSELA) are partnering to help expand workforce training programs to recipients of the federal Supplemental Nutrition Assistance Program (SNAP) in seven parishes in Southeast Louisiana. Under the agreement, UWSELA will coordinate its members' efforts to provide workforce training through the SNAP Employment and Training (SNAP E&T) program. The U.S. Department of Agriculture Food and Nutrition Service (FNS) provides federal funding for SNAP E&T, which helps SNAP recipients gain skills, training and work experience to increase their ability to secure regular employment and achieve economic self-sufficiency. SNAP E&T is an essential tool in Louisiana's workforce development strategy that provides employer-desired training to low-income, under-skilled residents receiving SNAP benefits. SNAP E&T helps unemployed individuals return to the workforce and helps under-employed individuals obtain additional skills to advance in their careers. "The United Way of Southeast Louisiana and its partner agencies have an excellent track record delivering services that improve the well-being of Louisiana families," DCFS Secretary Marketa Garner Walters said. "We see this partnership as a great opportunity to expand the SNAP E&T program statewide and to present Louisiana's SNAP recipients with more opportunities for a brighter future." As a DCFS partner, UWSELA will facilitate the reimbursement of eligible SNAP E&T expenses for nonprofit organizations providing job search assistance, job search training, education and vocational training services for SNAP recipients in Jefferson, Orleans, Plaquemines, St. Bernard, St. Tammany, Tangipahoa and Washington parishes. Under the SNAP E&T program, providers are eligible for federal reimbursement for SNAP-recipient expenses related to transportation, dependent care and supportive services, such as clothing, uniforms, equipment, emergency temporary housing assistance, books, supplies and tools. The amount and percentage of reimbursements vary based on the program and the types of expenditures. "FNS works with its state and local partners as well as other stakeholders in the workforce development community to coordinate and streamline support services to help SNAP participants move to self-sufficiency," said Bill Ludwig, USDA Food and Nutrition Service Southwest regional administrator. "We are committed to providing states the technical assistance, tools and resources they need to build more effective and job-driven SNAP E&T programs." Liberty's Kitchen, a SNAP E&T provider in New Orleans, used its program reimbursement to build a computer lab, which allowed it to expand its services to SNAP recipients. Liberty's Kitchen trained 55 SNAP recipients between October 2017 and September 2018. Of these, 27 have secured employment, 10 are enrolled in school, and eight are still enrolled in the program. "Sadly, 68 percent of Louisiana jobs pay less than $20 an hour, which isn't enough income to cover the basic household survival budget for a family of four," said Michael Williamson, UWSELA president and CEO. "Our new partnership with DCFS will build upon United Way's commitment to creating more pathways to high-wage jobs and support our nonprofit partners' efforts to expand impact across Southeast Louisiana." According to the United Way ALICE Report, a nationwide study on financial hardship, more than a quarter of households in Southeast Louisiana are working hard but do not earn enough to afford basic necessities. Higher wages made possible through SNAP E&T programs would mean more ALICE (Asset Limited, Income Constrained, Employed) workers could better support their families, be more engaged in their communities and reduce their need for SNAP benefits. Additionally, SNAP E&T can bring new funding to workforce organizations with limited resources and help cover supportive services that are needed for participants to be most successful (e.g., childcare and transportation). For more information on SNAP E&T reimbursements through UWSELA, please contact Jamene Dahmer at JameneD@UnitedWaySELA.org. For more information about SNAP E&T in Louisiana, visit www.dcfs.la.gov/snapet. The Louisiana Department of Children and Family Services is the state agency responsible for providing services to families in crisis and in times of financial need. DCFS works to keep children safe, helps individuals and families become self-sufficient and provides refuge during disasters. The department's Child Welfare division is responsible for Child Protection Investigations, Family Services, Foster Care and Adoption Services. The DCFS Division of Family Support is responsible for the federal Supplemental Nutrition Assistance Program or SNAP (formerly known as Food Stamps); Child Support Enforcement; Disability Determination Services; and federal Temporary Assistance for Needy Family funds (TANF). The DCFS Division of Emergency Preparedness and Response is responsible for leading Louisiana's Emergency Operations Plan Emergency Support Function-6 (ESF-6) and Recovery Support Function-3 (RSF-3), which require a constant state of readiness in order to support evacuation, response and recovery related to any type of disaster, including evacuation, sheltering, emergency food assistance and human services. For more than 90 years, United Way of Southeast Louisiana has been a leader and trusted partner in improving lives and making a lasting difference. We fight to eradicate poverty by preparing people for quality jobs, growing incomes, and affording better health and education opportunities throughout Jefferson, Orleans, Plaquemines, St. Bernard, St. Tammany, Tangipahoa and Washington parishes. We have a bold vision of equitable communities where all individuals are healthy, educated and financially stable - and we have a plan. United Way of Southeast Louisiana's Blueprint for Prosperity guides all strategic investments in programs, initiatives, collaborations, volunteerism and advocacy aimed at tackling poverty. For more information, please visit UnitedWaySELA.org. Find us on social: @UnitedWaySELA. USDA's Food and Nutrition Service (FNS) works to reduce food insecurity and promote nutritious diets among the American people. The agency administers 15 nutrition assistance programs that leverage America's agricultural abundance to ensure children and low-income individuals and families have nutritious food to eat. FNS also co-develops the Dietary Guidelines for Americans, which provide science-based nutrition recommendations and serve as the cornerstone of federal nutrition policy.